The Exhibition continues until Saturday 25th October 2014. Although raised in England, when I drive westwards towards the Welsh border where the scenery changes, and I leave gentle rolling countryside behind and the road starts to climb, I feel a great sense of anticipation and happiness. For I am approaching the land of my father’s – the place for some reason I call my spiritual home. Many of us feel like this about certain places and landscapes, when we have been brought up somewhere else, but the landscape artist Gwyn Roberts is different. 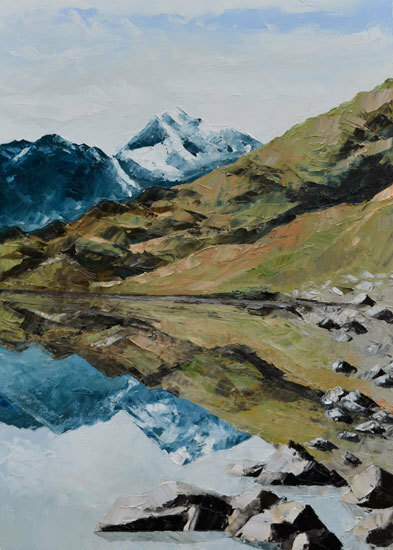 He is a rare breed – not only was he born and raised in the Snowdonia National Park, but it has undoubtedly served as his primary inspiration for the wonderful paintings we have come to relish. Man and boy he has walked and climbed every inch, recording this most dramatic of landscapes from every angle; you could say it is in his DNA. ‘I feel a deep hiraeth (longing)for the mountains of Eryri/Snowdonia. My forefathers have farmed and quarried these mountains for generations. They have worked some of Wales’ highest lands, through adversity and hardship, and have striven for education and broader horizons, whilst keeping their love for their traditions, culture and language. This has left me with deep roots and a great understanding of these lands,’ says Gwyn. Their resilience is manifest, since not only did they survive, they thrived. It is no wonder Gwyn paints with such passion and attack. You feel his joy and desire to get the information down. His paintings are bold and unforgettable. For this exhibition he has travelled to many extraordinary landscapes beyond his homeland and found in them a fresh impetus. Gwyn’s reputation as one of the finest landscape artists is sealed. His work is to be found in private and national collections all over the world. Referred to as a worthy successor to Sir Kyffin Williams by Huon Mallalieu of Country Life and The Times is praise, but Mallalieu was careful to point out that Gwyn was still very much his own man. He has absorbed what he needs from the past, including the Impressionists and the meticulous mark making of Cezanne, to forge an entirely personal vision.